At the bottom of the painting there is a circular mirror; we can see the tiny figure of a man wearing a turban. For some reason, the following is the explanation of the art historian Jean-Claude Frère: "a side window, under which we can just make out the tiny figure of a thief. He would seem to be spying on the couple as they count their gold, while they would seem to be oblivious to his presence, blinded by their greed". [vi] Let us leave aside the greed and concentrate on the tiny man. Is he a thief? I don't know. But I'm sure he is not "spying on the couple as they count their gold": I am not an art historian, but it seems clear to me that the man is inside the room, he is reading a book and looking out of the window to the street. 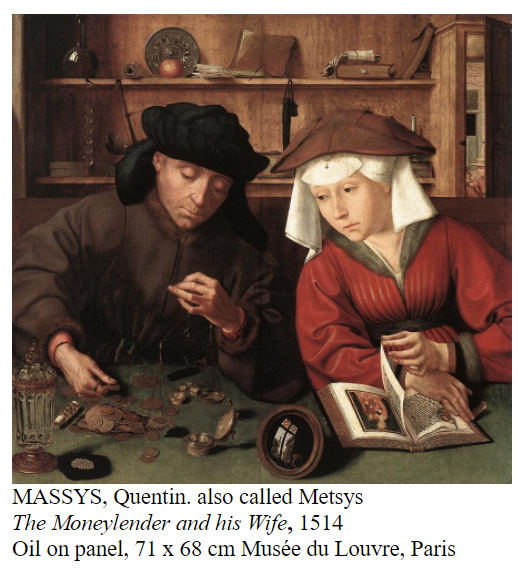 In think that this is not a casual mistake: it is consistent with art historians’ interpretation.Symbolism, a source of moralistic interpretation My view is that art historians explanation of The Moneychanger and his Wife as a satirical work containing symbolic allusions hidden from contemporary observers, is merely a reflection of their own prejudices concerning certain economic activities. Let us consider the serious arguments supporting the symbolic explanations of paintings of the Flemish Renaissance, in order to be able to judge when a painting has this meaning and when has not. The famous art historian Erwin Panofsky held that the Early Flemish painters had to reconcile the "new naturalism" with a thousand years of Christian tradition. Based on St. Tomas Aquinas, who thought that physical objects were "corporeal metaphors for spiritual things", Panofsky (Early Netherlandish Painting, 1953) maintains that "in early Flemish painting the method of disguised symbolism was applied to each and every object, man made or natural".